Specializing in Ukrainian Paintings by Artists From the Kharkov & Kiev School: Ukraine Collection, Exhibitions, Framing Service, Opening Hours. In the small town of Rathnew, on the main Dublin-Wicklow road there sits a treasure-trove of beautiful paintings by a dozen or more famous artists from the Ukraine. It's called The Wicklow Gallery and it's the brainchild of Murt and Tanya O'Brien. I first saw their collection of Ukrainian masterpieces at a show in Dublin and I was blown away by the magical 'egg' paintings of Alexander Vlasenko. Small scale, but the detail was incredible. And so was the price. I was no less impressed by the other exhibits - all by renowned artists from the Ukraine, some of whom are highly sought after by collectors and galleries in Western Europe and the United States. And almost every work was priced substantially less than anything remotely comparable by Irish or UK artists. O'Brien spends part of the year in Kiev, where he and his Ukrainian wife keep an apartment. As a result, they have developed good contacts with many of the country's top artists. They generally meet the artists in their studios before deciding to buy, and their selections appear to be excellent. 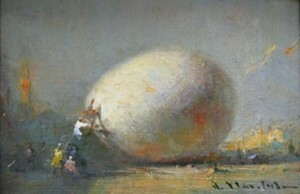 Mostly oils, they exemplify high quality draughtsmanship and painterly technique, in traditional representational styles harking back to Renaissance, Baroque and Impressionist schools. This is heavyweight stuff with none of the lightweight contemporary art we see so much of these days. Since the collapse of communism in the former USSR, contemporary art from Eastern Europe has suddenly stepped into the focus of the international art world. Exhibitions are now bringing Russian artists, as well as Ukrainian, Bulgarian, Romanian or Polish artists into the spotlight, with amazing results. The day when art from these countries was all about the ideologically correct style of "Socialist Realism" are long gone. Yet many regions retain a reverence for the basic artistic techniques of drawing and composition. There are presently two basic art movements in the former Soviet Union. The first is centered in Moscow and the second one in Odessa, in the Ukraine. Typically the Moscow movement is exemplified by a surrealistic and sober style, often including stylistic elements from the old tradition of icon painting. The Odessa movement is quite different, being more fauve-like, Expressionist and sometimes Impressionist. The long-established Odessa School of Drawing accounts for several generations of artists and many famous names. In the early 20th century, Ukrainian artists played a significant role in the evolution of modern art: for instance, Wassily Kandinsky - an early leader of the Expressionist style - received his first arts lessons at the Odessa Drawing School. Even during Communism, the Ukraine was always an important center for fine arts. See also Russian Art. Among the highlights of the gallery's collection are colourful rural scenes and still-lifes by Alexander Shabadey; captivating architectural paintings by Edward Yashin; local landscapes, still lifes and figures by Dmitry Podobedov; Impressionist landscapes and figures by Alexander Reznichenko; exquisite female figurative works by Dmitry Kolujny; the Botero-meets-Bosch fantasy-style figurative canvases of Sergey Alymov, and the mysterious giant 'egg' paintings and still-lifes by Alexander Vlasenko. 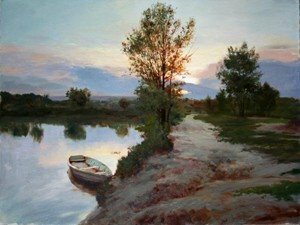 Other top Ukrainian painters at the Wicklow Art Gallery include: Anna Yuzvincevich (flower paintings, landscapes & cityscapes), Daniil Volkov (landscapes & seascapes), Victoria T Chaus (Impressionist landscapes and genre scenes), Victor Chaus (Impressionist figure paintings and landscapes), Elena Volkova (highly coloured still lifes) and Pavel Shumov (Impressionist figures, seascapes and scenic views). If you like beautiful art as well as the idea of buying a work that might double in price, as the artist's talent and reputation spreads, I strongly recommend you talk to the O'Brien's or visit the gallery. Their collection is wide enough to suit all tastes and all budgets. Review written by Neil Collins (Editor) (October 2008).  For other venues in Ireland, see: Irish Art Galleries.  For details of the world's best Arts museums, see: Art Encyclopedia.  For more about venues in Ireland like Wicklow Art Gallery, see: Irish Art Guide.